At left: Bigger definitely is better – another company presented peppers grown from its (hybrid) seed in these impressive rows. Chinese tomatoes in Italian pasta sauces, Chinese peppers on the Mexican market—the whole world is connected, and it seems that China is at the center of it all. Coming out of more than a century in which China was economically weak, China’s role on the stage of world commerce is growing exponentially. This has had a tumultuous effect on the world of chile peppers, with local traditions and global marketing existing side-by-side. I go online and read about the global markets; I walk around where I live in China and see the peppers being grown and sold right here. 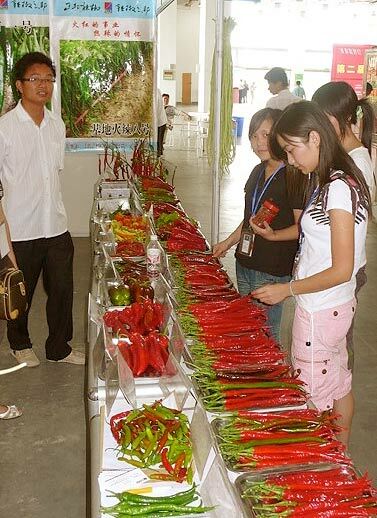 In the summer of this year, I had a chance to visit the third “China International Capsicum Industry Expo.” When viewed together, these experiences provide insight into the strange state of chiles, both within China and expanding from China outward. China-made products make up more than half of a typical American Wal-Mart’s inventory. 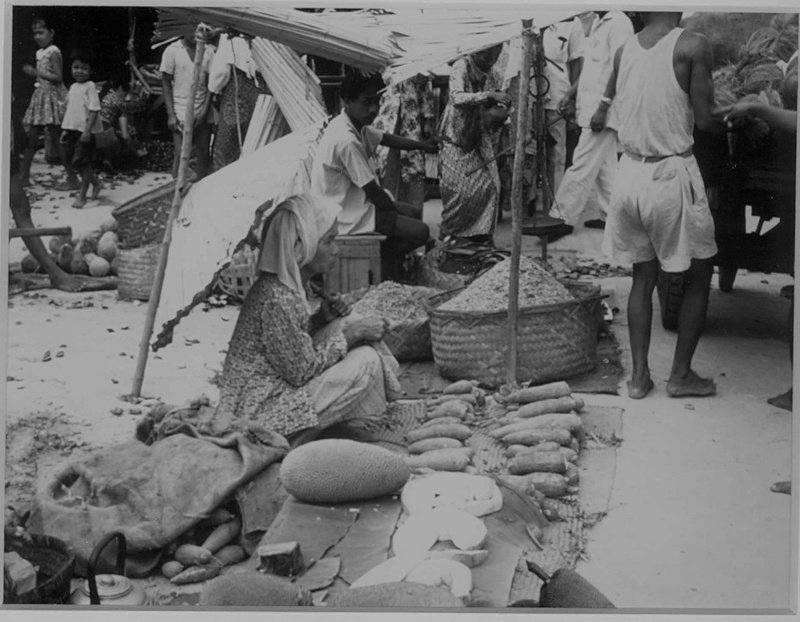 In addition, the country exports a plethora of agricultural products. This fact had received some attention a few years ago, when there were many complaints about the Chinese undercutting prices. In a particularly strange twist of fate, Mexican chile pepper markets saw an upsurge in the sale of chile peppers imported from China. Demand for habaneros has been on the rise. Even the Japanese have developed a taste for habaneros, and it was feared that the Mexican producers, unable to keep up with demand, would lose out to China. In the production of fresh chile peppers, China is already a giant: Here, 14 million (metric) tons of green “chillies and peppers” were produced in 2007 (according to FAO estimates). In comparison, Mexico, coming in at number two, produced just 1.89 million tons. When it comes to dried peppers, things are a bit different. India holds the top spot, with an annual production of 1.2 million tons; China produces just 250,000 tons. Even so, Chinese dried peppers have made inroads into Mexico’s chile pepper market. This may seem strange, given that chile peppers originated in Latin America, but considering that Mexico only produces 60,000 tons of dried peppers (relegating it to tenth place), and the fact that Chinese peppers cost less, it makes sense. 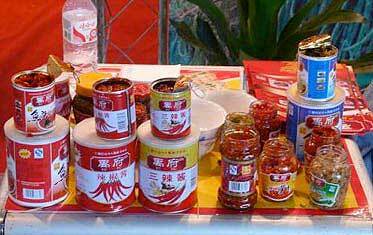 Top: Some of the ubiquitous pepper sauces, pure, with ginger and garlic, or with tofu. Bottom: Different producer, same traditional-style chile pepper sauces in different strengths and different, typical flavors. Things look different again when considering the pepper business. China is like a world unto itself, with rather limited outside contact. Talk about globalization? Well, it’s here—and it isn’t. While dried Chinese peppers are cheaply sold even on Mexico’s markets, hot sauces from China are still a rather rare sight. Typically, they are imports for Chinese immigrants and aficionados of Asian cuisine. Tabasco sauce is easier to find in western (e.g., Wal-Mart, Metro) supermarkets in China than chile sauces from China in the USA or Europe. The reasons are multiple. First of all, product quality/safety is a main concern. Some of the few notes on the dispute about Chinese peppers in other parts of the world come from reporting on shipments that were denied because Sudan Red was found in them. (Sudan Red is a coloring agent that causes cancer.) Secondly, tradition and a rather inwards-oriented view is very common—the vast majority of chile pepper sauces are produced for the Chinese market and for traditional Chinese tastes.